This makes me really sad. You know that, don’t you? Eleven years ago, give or take a month, the one and only Bruce Campbell flew in for the first Freaky Film Festival in support of traveling companion Josh Becker‘s real-time crime film RUNNING TIME. (Coincidentally, former Bloomington, IL, genre DVD label Synapse Films will re-release that film next year.) I remember it as if it were only yesterday, from Campbell tapping me on the shoulder at Peking Garden in downtown Champaign that afternoon to the mixer at the Red Herring Vegetarian Restaurant later in the evening and all the snarky joy in between. Since Becker and Campbell left town the following morning, neither has returned to Champaign-Urbana to the best of my knowledge. That hasn’t stopped the local showman with the most, Avon Theater Head Honcho Skip Huston, from reeling in The Chin for multiple guest appearances down yonder in Decatur. Having already charmed the Soy Capital citizens during promotional junkets for Don Coscarelli‘s BUBBA HO-TEP and his own satirical novel, Make Love (the Bruce Campbell Way), the B-movie favorite will return yet again to pimp his most recent directorial effort, MY NAME IS BRUCE, on Monday, December 1, with a show time TBD. “Most of you know this will be Bruce’s third visit to the Avon, and he is always a great host,” says Huston in one of several e-mails plugging the event. “Bruce is currently co-starring in the hit [USA Network] series BURN NOTICE – in fact, he is the best part of the show – and is always in great demand. Tickets will be available on a first-come, first-served basis. You may recall we have sold out all 708 seats in the big theater both times he has been here previously.” A follow-up message states that tickets will go on sale “around November 1,” so that’s the target date for Campbell fanatics to find the path of least resistance for securing themselves entrance. Squarely in the horror-comedy vein that the Detroit native is best known for, the Dark Horse Indie/Imagine Entertainment production MY NAME IS BRUCE stars Bruce Campbell as an arrogant, boozy, womanizing actor named Bruce Campbell who is tricked into battling a resurrected Chinese god of war in a remote Oregon mining town. 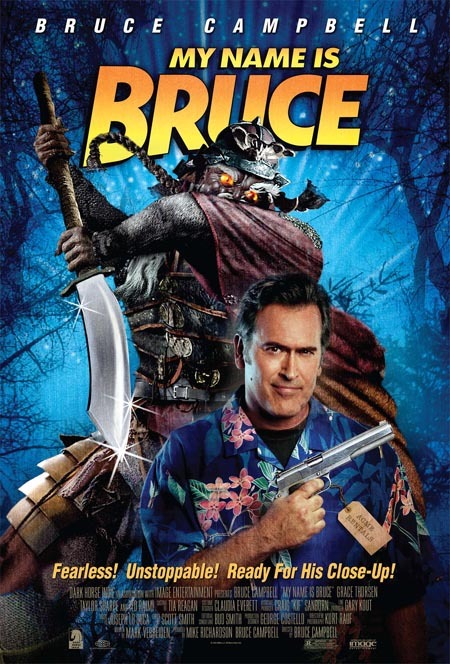 Produced by Campbell and Mike Richardson and written by Mark Verheiden, BRUCE also features Grace Thorsen, Taylor Sharpe, Ted Raimi, Ellen Sandweiss, Danny Hicks, and Tim Quill in the cast. Composer Joseph Lo Duca and cinematographer Kurt Rauf performed similar duties on the aforementioned RUNNING TIME, while many of these names might be familiar from the early works of a certain Sam Raimi including a certain horror classic named THE EVIL DEAD. This entry was posted on Sunday, September 28th, 2008 at 1:00 am	and is filed under Public Events, The Old School. You can follow any responses to this entry through the RSS 2.0 feed. Both comments and pings are currently closed.